In this special call-in episode, join Buddy, Alice, and Iconography’s Charles Gustine as they watch and review the infamous film adaptation of The Haunted Mansion. Released in 2003 and starring Eddie Murphy, can this oft-maligned movie redeem itself in the hearts of our hosts? We’ve got just over 98 minutes for you to chew on! Enjoy! Featuring an aside on Religion and Spirituality, many comparisons to Crimson Peak, and more than one mention of the Omnimover (Praise the Omnimover). Check out our Audience Survey—help us get to know you! 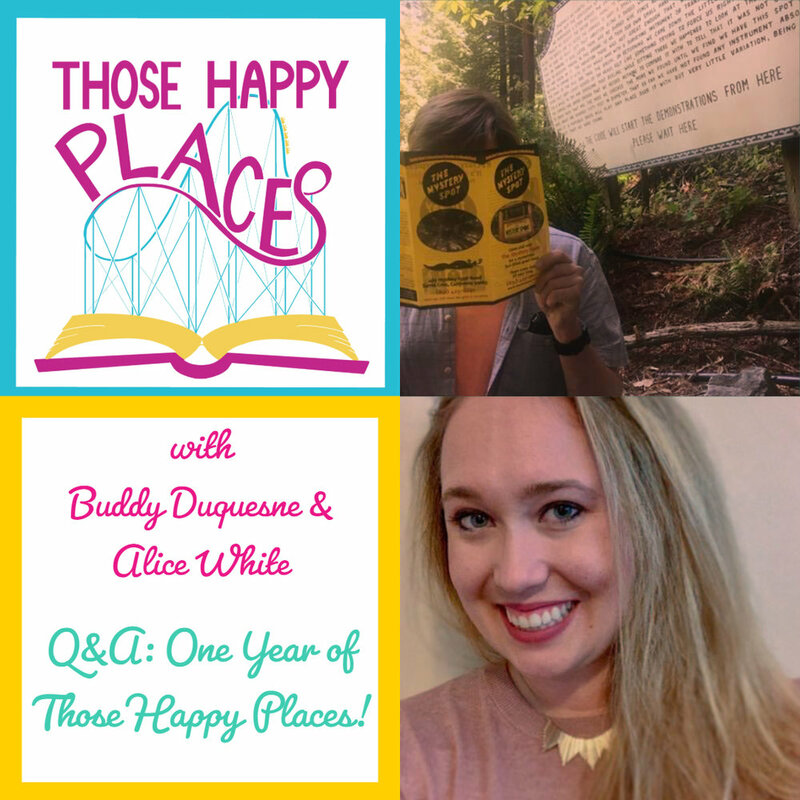 Q&A Special: One Year of Those Happy Places! In this very special episode, Buddy and Alice take some listener questions. It’s been one heck of a year—and they’ve got some big plans ahead! Stay Tuned! Discussion topics include: Extinct Attractions, Re-Imagining IP’s as Different Rides, Transplanting Disney Attractions, Building the Perfect Roadside Attraction, and Visiting International Parks! In this cosmological episode, Alice and Buddy dive into the ideas of Chaos, Control, and Determinism as they pertain to Theme Park Rides. How do various types of attractions offer chaotic experiences? What does the idea of chaos mean in rides that give their passengers a measure of control? Who controls a rider’s destiny on a ride? Featuring discussions on Bumper Cars, River Rapids, Autopia, the Teacups, and Astro Orbiters. Additional music comes from Kevin Macleod. All Tracks Licensed under Creative Commons: By Attribution 3.0 License. Tracks in this Episode: Bummin on Tremolo, Airship Serenity, Casa Bossa Nova, Breaktime, Lobby Time, Surf Shimmy, Bossa Antigua, Getting it Done, Hard Boiled, Mining by Boonlight, Crinoline Dreams, Poppers and Prosecco, Plain Loafer. In this symbolic episode, Alice and Buddy take a close look at one of the most iconic animated characters in history. What makes Mickey Mouse such a powerful symbol of the Disney Parks—not to mention the rest of the Walt Disney Company? How does he compare to other walk-around mascots? What, if any, are Mickey’s defining character traits? Featuring asides on Kingdom Hearts, the Sorcerer’s Apprentice, and the Legacy of Walt Disney. Additional music comes from Kevin Macleod. All Tracks Licensed under Creative Commons: By Attribution 3.0 License. Tracks in this Episode: Bummin on Tremolo, Airship Serenity, In Your Arms, Off to Osaka, Casa Bossa Nova, Breaktime, I Knew a Guy, Poppers and Prosecco. In this conventional minisode, Alice reflects on her experience at Podcon Seattle. What do themed spaces have to do with the vast blank canvas of convention halls? What are the benefits of being at an event that draws people together? How does it feel to meet your listeners—and the people you listen to? This Minisode is a preview of our Patreon member benefit—available at the “A Ticket” Tier and above! Check it out and consider supporting us! Additional music comes from Kevin Macleod. All Tracks Licensed under Creative Commons: By Attribution 3.0 License. Tracks in this Episode: Bummin on Tremolo, Airship Serenity, In Your Arms, and Off to Osaka. In this festive episode, Alice and Buddy take a trip to Knott's Berry Farm to discuss its Holiday overlay, Knott's Merry Farm! While on an iconic coaster, Alice was struck with inspiration--why do we scream on thrill rides? Are we performing for others? What makes the social experience of theme parks unique? Plus, an aside on Ghostrider, the wooden coaster in question, and a particularly emotionally resonant end-of-the-year message! In this moving episode, Alice and Buddy take a look at the ways Ride Vehicles interact with the fiction of theme park rides and attractions—how do they function in -universe? What separates the diegetic vehicles from their non-diegetic counterparts? How do some attractions transcend their vehicles non-diegetic qualities? Featuring discussions on Roger Rabbit’s Car-Toon Spin, the Haunted Mansion, Universal’s Studio Tour, E.T. : The Ride, and Transformers: The Ride. 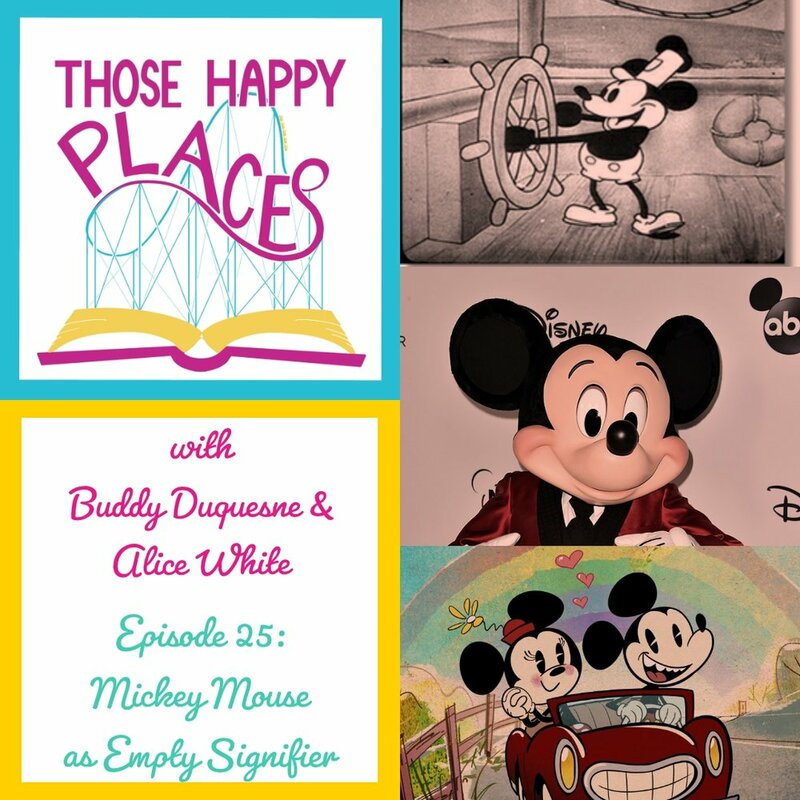 In this rollicking episode, Alice and Buddy set course for Disneyland’s Pirates of the Caribbean to discuss its complex relationship with history, and the ways it has gradually changed over time. How have audience tastes and needs changed over time? Has the attraction changed sufficiently to reflect them? What, exactly, is this attraction’s theme? What is its relationship to history? What is its relationship to its own history? This one’s a bit long! Keep a weather eye open—there be squalls ahead. In this spooky episode, Alice and Buddy take a look at Halloween’s origins, its unique traditions and tones, and its role in extending theming into our daily lives. Then, they analyze how Theme Parks tackle Halloween, by taking a look at Disney’s American parks, and Knott’s Scary Farm! In this thrilling episode, Buddy and Alice return from a research expedition to Knott's Berry Farm in Buena Park, California, to talk a little about Tension--Literary, Narrative, and Physical--in the Roller Coaster experience. How do Xcelerator: The Ride, Hangtime, Silver Bullet, and Jaguar employ principles of tension in their design? When is tension healthy and welcoming, versus unhealthy and dangerous? How do stories, thrill rides, and catharsis relate to each other? Listen in to find out!